Hello there Zakka Along 2.0 blog hoppers and other guests! It's my week on the blog tour for Patchwork Please. 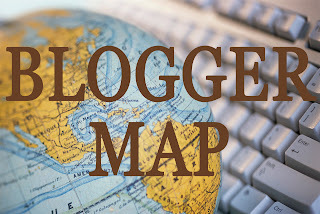 It is so exciting for me to support Ayumi's first book by participating in this blog tour - I think she is the most generous designer in blogland. 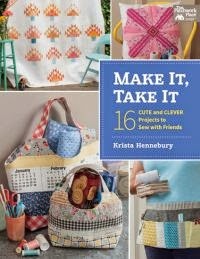 I've made almost every one of the free tutorials offered on her blog Pink Penguin and I look forward to making more cute projects from this gorgeous book. For my version of My Scrappy Box (featured on page 77), I chose hand printed scraps purchased from an amazing fabric designer (that I met in London! ), Lucie Summers. I snuck a small piece of my own poppy print in there as well. The solids are Kona's and the linen is Essex yarn dyed generously supplied by Kaufman. The lining is a Moda print by Lucie Summers from her Summersville line. The pattern suggests foundation piecing the skinny strips onto paper, but I was able to piece them together normally without difficulty (note that the TIP bubble on page 78 gives 6 1/2" x 9" as the side panel measurement, but I think that should actually be 5 1/2" x 9"). I would recommend cutting out your heavyweight interfacing pieces AFTER you get your panels assembled - I had to make some adjustments to the stated pattern sizes. 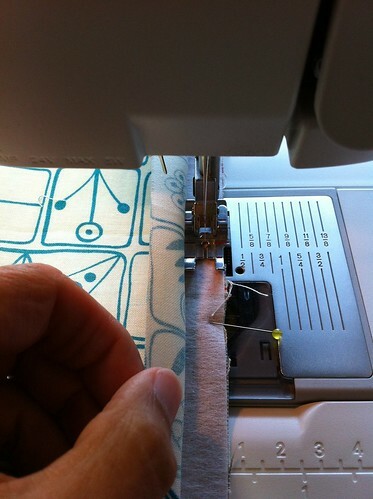 ETA: I used Pellon Peltex for my heavy weight interfacing and the box is plenty sturdy. I was confused by some of the pattern measurements and after reading the full instructions, I believe the editor's have switched some of the panel length and width dimensions. This doesn't really matter, unless like me, you have a directional fabric for your lining or outside end panels. The main thing to remember is that you need an extra 1/2" of lining fabric overhanging the bottom of each side/end panel, therefore the lining pieces need to be cut 1/2" longer (taller) than their corresponding outer panel. When I reached the Assemble Box section on page 79 I could not understand how step 11 worked, so I ignored the part about drawing a line at 1/2" and instead just attached every panel to the bottom linen piece with a 1/4" seam allowance. Remember to hold or pin the lining raw edge out of the way (see below). I started stitching from the centre out to the edge of each panel, stopping with a backstitch. Hand-stitching the corners together with a ladder stitch worked out beautifully! This box is the perfect size for commercial quilt patterns and dressmaking envelope patterns, too. If you make a My Scrappy Box of your own, be sure to link up by Sunday, August 4th on Lindsey's blog to win a $50 Zipit gift certificate and Pellon product! Thanks to this week's generous sponsors, I've got some goodies to give away! Leave one comment on this post (please indicate your country) for a chance to win the prizes listed above. Random winners chosen on August 3rd. 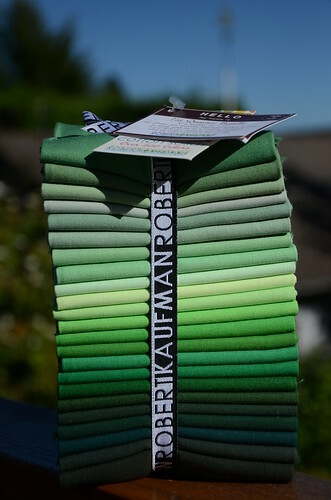 IN ADDITION I'd like to give away this amazing stack of 23 Kona Fat Quarters from Zakka 2.0 Along sponsor Robert Kaufman. I'll send it anywhere in the world as long as the winner is prepared to cover the cost of shipping. To enter the FQ stack giveaway please go here and leave one comment agreeing to pay the true cost of shipping. Please note that comments left on this "My Scrappy Box" post WILL NOT be included in the FQ stack giveaway. ETA: Comments are now closed, thanks for visiting! Thank you for the giveaway. I live in the United States. Neat little box you made. I would pay shipping if I won. Thanks for the chance. I would gladly pay shipping if I won. I had no idea that Ayumi write this book. I love her, so I guess I need to order a copy! Hello from Minnesota! Thanks for the tips. I'll admit, I postponed making this one because I was confused on the read-through. I love the size though and have tons of old patterns to store so I hope to get one stitched up this week. Your box is so cute! It looks so sturdy. What type of interfacing did you use? I love your new box...and the fabric is wonderful!! Way to go!! I'd like to enter the giveaway! I live in the US. Great box, I like your scrappy fabrics too. I live in the US. 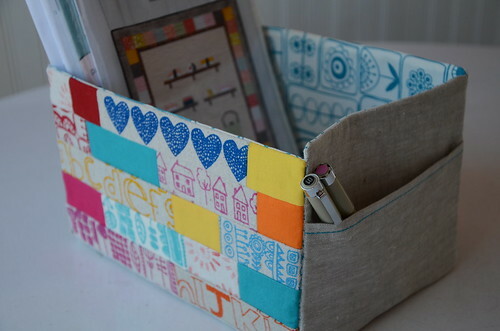 I love the box - I have a lot of patterns that are overflowing the pockets of a three-ring binder, and this box would be perfect! Thanks for the give away. 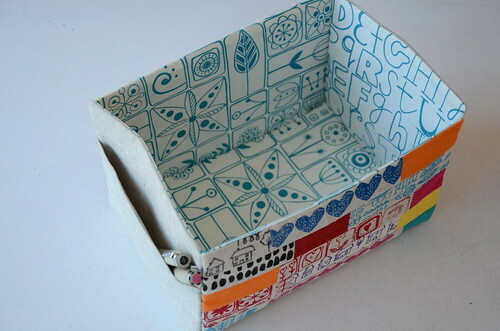 Lovely scrappy box, Krista! 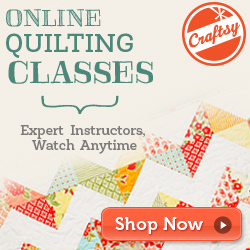 I think your fabric choices are perfect and can hardly wait to try making my own version. Ayumi's designs are always so lovely and inspiring. Thanks to for the tips on making this. They will come in handy! Thanks for the chance to win your lovely giveaway. (I'm in Canada). Your box is wonderful and I am going to make one or three for my sewing table which right now has three boring white IKEA boxes on it. I would love to win the prizes from your generous sponsors, thank you for the chance, and I live in Canada. Please enter me in the giveaway - I live in Canada (Vancouver Island)!! Cute box Krista! I live in Canada ;) Also btw I linked your spray basting tutorial in my lasted blog post! Thanks for the chance to win the zakka items. Hi! That's a fantastic box and so beautiful with your fabric choises ! Finnish womand sends you sunny wishes from Greece! Very cute scrappy box. I live in the US, but you already know that. Thank you for the tips on your scrappy box - I'm going to make one for my patterns! What a lovely scrappy box! I love the tutorials on Ayumi's blog, but I still have to get my hands on her book. Thanks for sharing! Such a great idea! I've been looking for a bin in a color I like--you may have provided the solution to my pickiness (although it will mean actual work for me!) And I'd happily pay shipping! Love those fabrics made by Lucie Summers! Very cute box! I would love to pay shipping on that great bundle of greeny fabrics! Great tips on the box! Thanks for the giveaway and participating in the sewalong. Im in Minnesota in the USA. the box is very sweet! The scrappy box is really great, now planning to make one next week, hope I can find some Pellon Peltex or equivalent here in Israel. Thanks for a chance for the giveaway! Thanks for sharing your tips on making the scrappy box. Such a wonderful way to display our favorite fabrics, and store patterns. Thanks for the giveaway. I love the cute patchwork box. Thanks for the chance to win. Thanks for allowing us to visit your great stop on Ayumi's book tour, all from the comforts of home here in Colorado, USA! Enjoy! Wow! I might have to make a few of those boxes. And what awesome prizes! Thanks for the chance to win. I am in Canada and will pay for shipping. 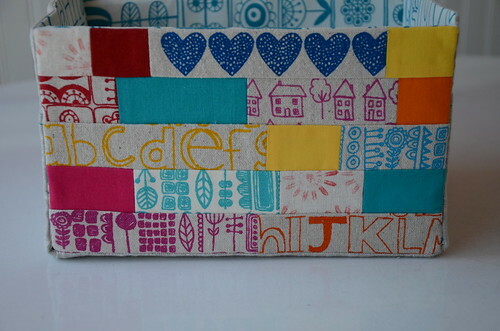 Your box turned out fabulous and what a great use of such precious scraps! I'm in the USA! so glad i read your post. Now i will adjust those measurements and make a note of the tips. Ahhh, I love Lu Summers hand-printed fabrics! I'm trying to decide which ones to order for myself. Thanks for the giveaway - I'm in the US. The box turned out beautifully Krista. It's going to look lovely in your studio! Your scrappy box looks great. How good would it look with boxes lined up along a whole shelf! I'm in Australia. Thanks for the lovely giveaway. Your box turned out great! I love all the fun alphabet prints! Yes please - O Canada! Great box, thanks for the tips too. I am in the UK! Thanks for the construction tips. I think these would be so sweet in monochrome scraps and strings. 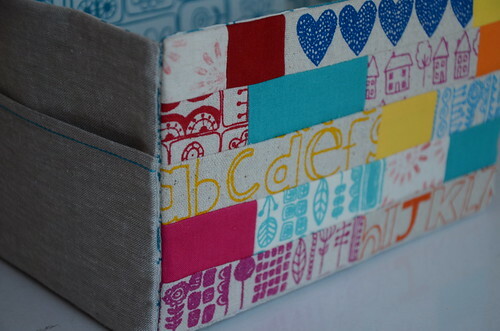 I love this box, the Lu Summers fabrics are so fun. I live in New Zealand. Thanks for the great tips on the construction, Krista! I hope to get started on it this week. Thanks for a great giveaway too! Cheers, from Saskatoon! No problem paying for shipping if I am a lucky winner. I'm in the UK so please count me in for giveaway numbers 1 and 3. Thanks for the opportunity! Thanks for the tips love your box. I live in Australia. Love your box!! I live in the USA and would love a chance to win! Great idea for holding patterns. We could all do with one of these! Love from Australia! Thanks for the tips and suggestions. I live in Indonesia. I have some of those prints and they are terrific for the box you made:) Thanks for the inspiration and the chance to win! Love the box, looks perfect for school supplies. I live in the USA. Love your box! 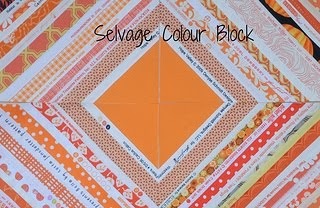 It would be great for holding an English paper piecing project. I may have to give it a try. I'm in Canada. Ooh, the box looks fab, especially with Lu's prints. Thanks for the chance to win, I'm in the UK. Very cute box, and thanks for the measurement corrections. Wet and windy UK. You grabbed me right away with the hand printed by lucie-beautiful choice! I was thinking of scaling this down for a cd catcher in the kitchen, but now I see it Must be used for my quickly growing pattern collection! Doh! Forgot to post my country-- Sweden! Cheers! Your box is beautiful. Love your fabric choices. Thanks for sharing. From Michigan in the USA. Love the bin and Lucie's fabric (I ordered some of the same from her a while ago). Ayumi's book is so wonderful, I want to make every single thing in it! Lovely fabrics in your Scrappy Box, it looks beautiful. I live in Australia, thanks for the chance to win. Your scrappy box is so cute, and they are so handy. I've made a few myself. I live in Canada. Thanks for the giveaway. this is so pretty Krista!!! And so glad you had fun at the retreat! Your box is lovely - and it gave me ideas for Christmas gifts. Thanks! I live in the USofA. I am in Canada..and of course would be happy to pay shipping for that great bundle! I live in the US. Thanks. Your box is very lovely, as was the one in the book. Unfortunately, I couldn't figure out how it worked, either, so I decided to skip this one. Great job making yours for the sew along. Thank you so much for the tips! They are going to be really useful when I try making the box. The fabrics you've chosen are beautiful! I live in Italy. Despite the hiccups, I would make this again. Cute box. Thanks for the chance. I'm in the US. Great fabric choices! I'm in the US. Your box is great! I have loved this tour and all the projects in the book! thank you! This looks like a useful project to tackle one day! Love your box! your fussy cuts are wonderful. Thank you for the extra instructions! Need some thread. Figure out a use for the other goodies. Live in USA. thank you for the giveaway. Of course I would pay shipping if I am lucky enough to win. Love the box you made! I am loving this sew along also your box turned out so great. Thanks for the chance to win. Love the variety of greens. The box is fantastic...may have to try one. I'm in Canada, Ontario to be precise.